Wicker patio furniture tends to be durable and resilient but does require some regular cleaning and overall care to look its best. Both natural and synthetic (resin) wicker will last longer if it's kept out of direct sunlight and is not constantly exposed to the elements. Cleaning either type is the best way to keep it looking good, but cleaning methods vary somewhat for natural and resin materials. Vacuum natural wicker regularly, using a brush attachment to remove dust from the crevices. If it is heavily soiled and vacuuming is not enough, spot-clean the wicker with a solution of mild dish detergent and warm water, using a sponge or an old toothbrush. Rinse with a clean, damp sponge or rag. Allow the furniture to dry completely before using it. Never sit on damp wicker furniture because putting any weight on it could cause it to sag. Also, failing to let the material dry completely can promote mildew growth. You can use the same cleaning methods for natural wicker on resin wicker, vacuuming with a brush attachment and spot-cleaning with a sponge or toothbrush, dish soap, and water. But if your resin wicker gets really dirty, or it's full of dust after the offseason, you can give it a deep cleaning by hosing it down. If necessary, rinse it with a hose, then scrub it with a soft brush and soapy water, then rinse again with the hose. Let with wicker dry thoroughly before using the furniture. The best way to care for both natural and resin wicker patio furniture is to keep it clean and dry. Vacuum it periodically with a brush attachment to remove dust and pollen, as needed. 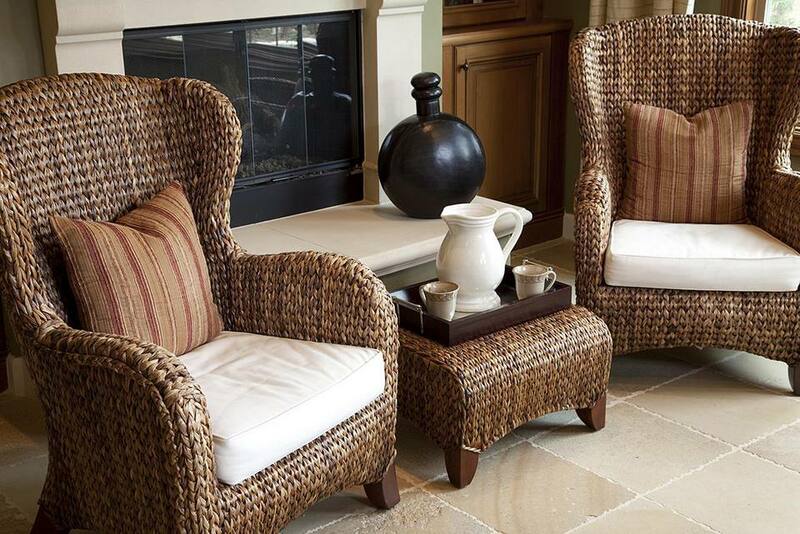 Keeping wicker clean extends its life because dust and other organic material can easily collect in the crevices of the weave and cause mildew, which leads to a breakdown of fiber and eventual decay (of natural wicker). For the same reason, it's also important to clean up spills and stains as quickly as possible. Although most wicker patio furniture is designed to stay outdoors year-round, it can become brittle in very cold weather and more elastic when it is very hot. As a result, using the furniture during very cold or hot weather can lead to premature wear. Also, excessively damp weather can lead to mildew, particularly with natural wicker. All wicker patio furniture will last longer and retain its color best if it is kept under a patio roof or other cover and is not exposed to direct sunlight. Sunlight can damage natural wicker fibers and cause unraveling or cracking, and it is hard on paint. Resin wicker also is damaged by direct sun, despite what manufacturers may claim; sunlight damages all plastic. Finally, inspect the weave of the wicker occasionally to make sure it is tight and doesn't show wide gaps due to shifting. If you find evidence of shifting, simply move the weave back into place with your fingers.